Born in 1885 to a famed and forward-thinking painter and “prophet” of a national revival in architecture, Witkacy was schooled at home by distinguished family friends. He was encouraged to explore his creativity in every direction. Witkiewicz senior worshipped individualism, and when the son eventually rebelled by briefly attending Krakow’s famed Academy of Arts, the father was distraught that his offspring might become one of the school’s “piglets”. To mark Photomonth and seventy years since Witkacy’s dramatic death in 1939, Krakow’s Bunkier Sztuki will be showcasing some of his most enduring photographic images in a series of “psychological” portraits that range from the hauntingly ethereal to the grotesquely lucid and comically absurd. Aptly titled “Witkacy. Psychoholizm,” curators Stefan Okołowicz and Maria Anna Potocka seem to have coined the phrase psychoholizm especially for Witkacy, whose uncanny brand of photography abandoned conventional perspective and subject matter in favour of existential studies of the human psyche. This should not be construed as an abstract aesthetical decision, but rather as a natural outworking of Witkacy’s nature. He was consciously enmeshed in a perpetual metamorphosis that engulfed both his personality and his creative output. Indeed, for Witkacy, such ambiguity was an essential mode of human existence and of the artistic vocation in particular. Though his photography can stand alone, it is couched in a large body of theoretical work in which he elaborates his fundamental notion of “Pure Form”: that true art cannot merely imitate life but must go further, and evoke “the unity of multiplicity in the human personality” in order to betray what Witkacy termed “the metaphysical strangeness of Being” – the primordial condition of human existence. Increasingly obscured by the irresistible development of civilization, which constantly sets itself up against the individual, Witkacy saw it as the task of art to return the self to the bare metaphysical horror of Being. “Art,” he once mused, “is an escape. The noblest of drugs.” But one that was quickly losing its potency in the face of an ever-increasing “tranquilization” of society, through false religion, mediocre art and empty metaphysics. However, it seems doubtful that Witkacy saw photography as a vessel of true art – limited in its nature to imitation – though we should exercise caution in allowing this fact to influence our reception of his work. 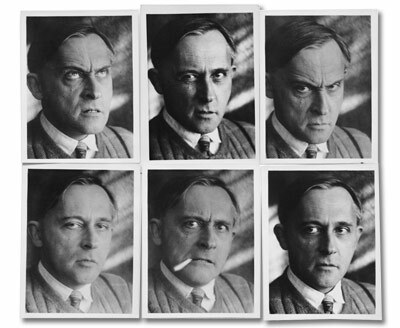 Witkacy was known to conduct long, drawn out photographic sessions, subjecting his muses to existential ordeals in search of an authentic look of horror or awe at the “strangeness of Being.” Witkacy was extremely intuitive, and his insight into the psychic life of his subjects often verged on clairvoyance. His approach raises a question: which was the more profound, the process or the product? At times, we might be forgiven for thinking that with Witkacy the camera was a diabolical apparatus in the hands of an ecstatic seer. Yet his portraits can seem to peer so profoundly into a soul, they broach the question of how far this form of mechanical reproduction can penetrate the merely external and projected. We may wonder how accurately these images capture the unique persona of their subject, and how much they instead capture a preconceived notion, a stereotypical mood, or a characteristic of human beings in general. And we may wonder about Witkacy’s intentions: if true art is “the sole crack through which it is possible to get a glimpse of the horrible,” then what we have here is perhaps the record of an artistic happening. reflection cast through a pair of mirrors to create a “ministry” of alter-egos, all seemingly poised to determine a strategic matter of grave importance – who, precisely, is who? But no answer is forthcoming. Revealingly, the true Witkacy (already once removed by the lens) has his back to us, yet his countenance, his most identifying physical trait, his “mug,” physiognomy or “phiz” (as he dubbed it) is mediated to us and spliced through the taint of a mirror. But such a figurative and theatrical composition is by no means typical – far more common are bare studies of the “phiz.” Witkacy had his camera modified with the addition of a section of water pipe, allowing him to focus at very close range: this led to a series of images that explore the exotic and wild terrain of the human “mug.” He would often crop images so that the face occupied the entire image, removing any sense of perspective or context, and unmasking the face in its brazen otherness. In other examples, the image is kept out of focus, creating a look of spectral luminosity and an eerie sense of instability. In the 1930s Witkacy developed his “mime theatre,” in which he would take a whole series of shots depicting a succession of “mimes” or doubles, giving artistic expression to his belief in the divisibility of the self. In many ways the outbreak of World War 2 in September 1939 embodied an apocalypse – both personal and historical – that had preoccupied Witkacy throughout his adult life. He had long decried the decline of art, and the mechanization of life that was steadily giving rise to a race of anaesthetized drones in a metaphysically neutralized society – most emphatically so in dialectical materialism. When Witkacy learnt of the invasion of the Red Army from the east, he committed suicide. True to the nature of a visionary, his creative achievements were scarcely recognized within his own lifetime. Witkacy remains a fascinating and enigmatic character to this day, whose work continues to shed light on the fundamental questions of human nature and the role of art in society. Witkacy. Psychoholizm will be on display at Bunkier Sztuki (pl. Szczepański 3a) from 30 April until 7 June. Curated by Stefan Okołowicz and Maria Anna Potocka.